A little orphan who has a penchant for trouble, realises that her imagination can set her free. SKETCH was co-directed by twin sisters Lyndsey and Tracey Walker. Wright Walker Productions and Freed Spirit Productions co-produced the project. Production took place in January 2012 and received attention on the festival circuit. The film was screened at the Congleton Film Festival and the Northern Exposure film festival in Kendal. 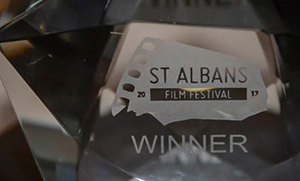 It was also selected to be screened at the St Albans First Annual Film Festival as part of their 'Films for Kids' Category in which it won the Juries Award. SKETCH was 'Highly Commended' at the First Cumbrian Short Film Competition held in Windermere and our little actress Amber was quite excited to find out that the judges included Professor Snape!